Our 12-inch Sauté Pan with Lid is shallow enough for easy sautéing, but generous enough to accommodate plenty. Curved sides encourage flavors to meld and deepen during simmering and braising. The 12-inch Sauté Pan with Lid is shallow enough for easy sautéing, but generous enough to accommodate plenty. Curved sides encourage flavors to meld and deepen during simmering and braising. A must-have member of the CookServ collection, which combines artful elegance with cutting-edge cooking technology. The 5-ply stainless steel construction has an aluminum core for fast, even heat distribution. Corrosion-resistant, non-reactive, stainless steel interior surface won’t alter the flavors of your food. The exterior layer is composed of magnetic stainless steel—great for all types of cooktops. A fabulous Nambé exclusive piece that’s attractive enough to be taken directly from the stovetop to the tabletop where it can be used as a beautiful serving piece. Technical Details: Nambé Gourmet CookServ Stainless Steel Cookware is designed to effortlessly go from the stovetop or oven directly to the table as a beautiful serving piece. When you purchase Nambé Gourmet CookServ cookware, you are bringing award-winning Nambé design into your home as functional sculpture for every day use. The elegant belly shape and stylish curved handles look as good as a serving piece as it does on your stovetop. Nambe Gourmet CookServ 5-ply Cookware is high-performance cookware featuring five layers of material designed to provide superior heat conductivity and top-of-the line cooking performance. The interior layer is corrosion-resistant 304-grade stainless steel, which is non-reactive and won’t alter the flavors of your food. This layer is bonded to three interior layers of aluminum to allow your cookware to heat up quickly and evenly, not only on the bottom of your pan, but all the way up the sides. The exterior layer is composed of magnetic stainless steel, which can be used on all types of cook tops, including gas, electric and induction. 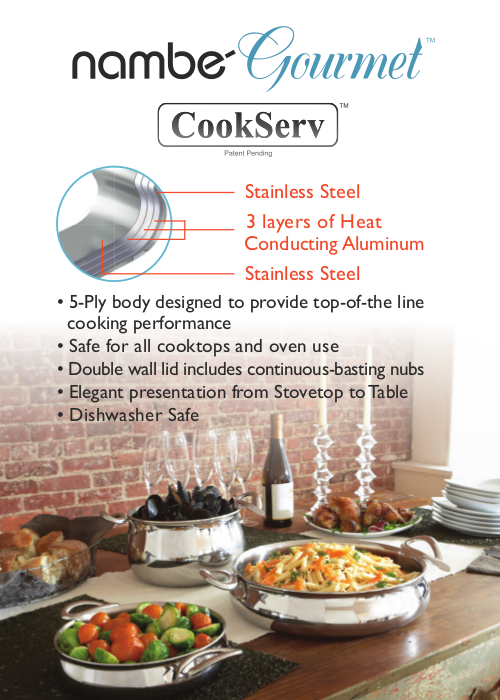 Each piece of CookServ cookware features a double-wall Stainless Steel lid with a concentric pattern of Continuous-Basting nubs on the underside. Continuous-Basting nubs collect condensation during the cooking process, which then drips back onto the food to distribute moisture throughout all parts of the dish. The double-walled lid insulates the contents of the cookware to keep food warmer longer, and ensures the lid handle remains cool to the touch when used on the stovetop. In addition, the flared edge with sealed rim makes pouring a snap, no interior rivets mean easy clean up, and the curved loop handles stay cool to the touch due to their solid stainless steel construction.